Last night we were treated to a show in Ames, Iowa when the Longhorns came in and started from the onset of annihilating the Iowa State Cyclones. It was a steady dose of passing and running throughout the game. While most Longhorn fans were confident that this would be a sure victory, after last season’s fiasco, there had to some within the Longhorn family that was nervous and worried, because this Iowa State team had pulled an upset that nobody saw coming already this season. 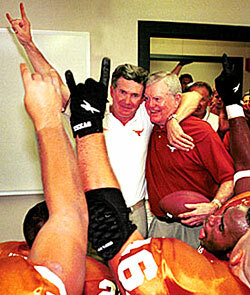 This was going to be a nice challenge for the Horns before their annual rivalry game with Oklahoma. Most fans would have been happy to see a team with a consistent movement and be able to show a chance at making some big plays. 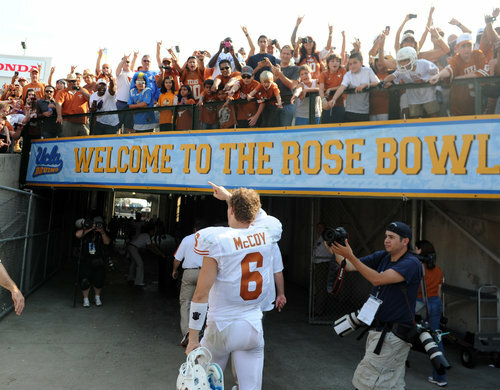 What Longhorn fans were treated to was somewhat of an offensive clinic from Case McCoy and David Ash. Both Quarterbacks showed a pocket presence that would go beyond their youthfulness, and showed some flash of excitement as the starting quarterbacks. While they are young and inexperienced, they have shown the ability that keeps both of them getting snaps and alternating in the offense. While Iowa State is not an Oklahoma caliber team, there is a lot of hope building within the fan base that the Longhorns will be able to steal a big win in Dallas next weekend. A win like this is just a building block for a young team that should help lay the foundation for the future. The only puzzling question is going to be who will win the starting position outright? Texas is 3-0? Who would’ve guessed it? At the Start of the season, I was figuring Texas was looking to bounce back with a solid 8 win campaign and I had them being 2-1 after the first three games, but that was the best case scenario. Fast forward to the season and the Longhorns just had their way with UCLA and are now 3-0. This is a surprising revelation for any fan, even the most optimistic and diehard fan had to figure that a 3 -0 start wasn’t in the cards for this team. Given the fact that Garret Gilbert was the starting quarterback, there wasn’t any sign of hope for this to happen. Thankfully Mack and the coaching staff came to their senses and decided to hand over the starting job to Case McCoy and David Ash. 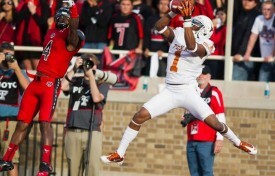 This is why the Longhorns left Los Angeles with a victory. These two quarterbacks are an exciting combination and have energized the offense and will help this young team build on an already magnificent start. Nobody thinks this team will go undefeated and compete for a championship, but with each game and another win, something special could happen. This is where the coaching and youth need to find a happy medium, but the youth can mature this season, and start building the foundation towards something special in the future. 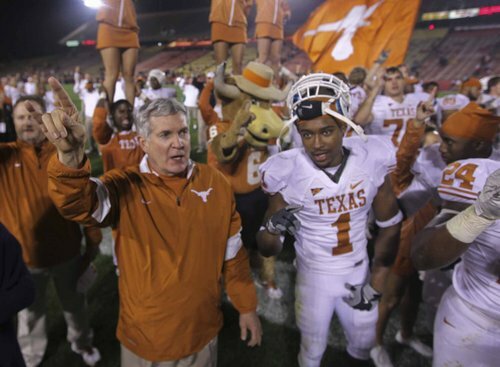 Right now Texas is 3-0, but with some luck and preparation, they could easily make it to the October showdown in Dallas with an undefeated record. But that is still a ways off, and nobody should start looking ahead. The fans and the team need to take it one game at a time, one series at a time and let the momentum build to where the football gods will let it go. There are some exciting things happening on the 40 acres, and as long as the coaches let the team learn and build, things will fall into place. Who expected this to happen after the disaster from last year?